My father is a real seafood man. I've seen the old-fatty order seafood platters at restaurants all over the country. I've witnessed him bask in delight while enjoying a $70 platter at an upscale restaurant in New York and wither in pain after consuming the $11 seafood platter from Eat n Park. I actually just had dinner with him this weekend and he was telling me about some seafood platter he ordered recently. The man is a machine. It must be a Pittsburgh vernacular phenomenon. 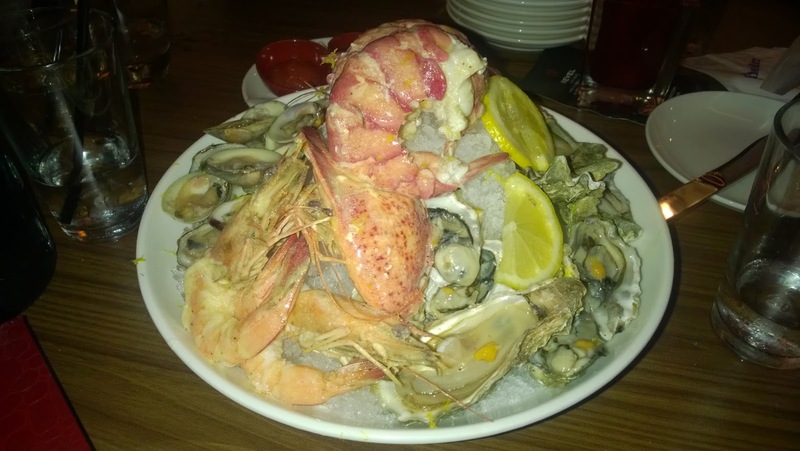 I'm accustomed to the phrase, "seafood platter" as well as the more formal, "plateaux de fruits de mer." However, I am not accustomed to the phrase, "seafood tower." It seems that in many parts of the country the dish is called a seafood tower. Revel and Roost offers three different sizes of towers, petite ($24), grande ($36) and royale ($55). Pictured above is the royale. The shrimp and lobster were actually quite good, but the clams and oysters did not seem very fresh. Indeed, the quantity and quality of seafood was a bit disappointing for the price. Also noticeably missing were the uni (fish roe) that were promised by the menu. Right next door to Revel and Roost was a restaurant called George Aiken's Chicken. Now, any old timey yinzer would know the place. But in this age of royale seafood towers, such treasures have been forgotten. The really interesting thing about George Aiken's Chicken is that they were the subject of a copyright lawsuit that went before the United States Supreme Court and forever changed the landscape of radio public broadcast royalties. So when you dine at Revel and Roost, you are really participating in the great history of American jurisprudence. However, I recommend avoiding the seafood tower and enjoying some fried cheese curds.